Katy Daley-Mclean had a long time to wait between her 99th and 100th test, but having reached the milestone last month she has no plans to hang up her boots yet with a Women's Rugby World Cup in New Zealand in 2021 a tempting prospect. Katy Daley-Mclean is no stranger to big matches, she captained England to victory in a Women’s Rugby World Cup final after all, but the fly-half was wracked with nerves as her 100th international approached. The absence of a June tour for the Red Roses meant that Daley-Mclean had been stuck on 99 caps since the end of the Women’s Six Nations in March. 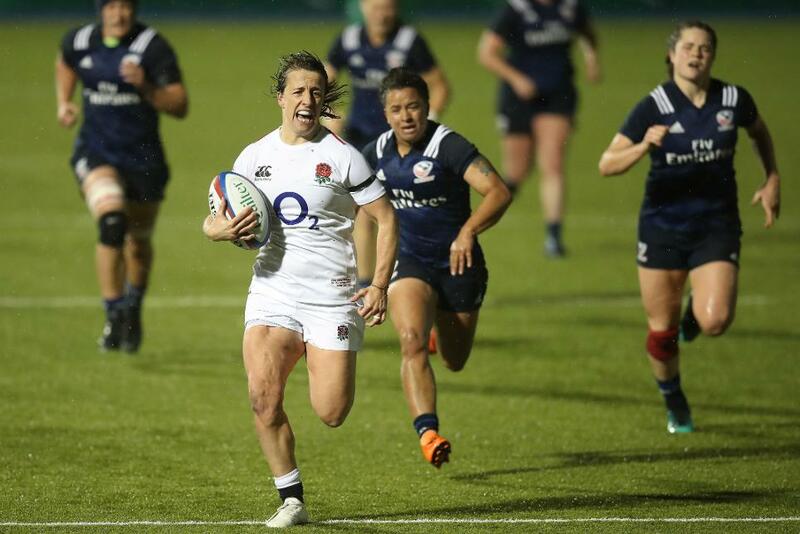 In the eight months between England’s defeat of Ireland at the Ricoh Arena and the USA’s visit on 9 November, memories of an insipid performance on her 50th cap were never far from her mind. On that day in Esher, Daley-Mclean missed several kicks as England were held to an 8-8 draw by New Zealand and as kick-off at Allianz Park edged ever closer, she vowed not to get sucked in by the emotion of the occasion again. “Once the squad had been named and I kind of knew I’d be in line to get it, you know you have the nerves about just making sure you actually get to be on the pitch,” she said. Daley-Mclean was helped in north London by the presence of long-time friend and team-mate Sarah Hunter in the changing room and some “wise words” from England’s most-capped player, Rocky Clark. “She (Clark) basically told me not to be rubbish,” she remembered, laughing, “and obviously to enjoy it. “I think, as well, the kind of relationship us old girls have, we’ve been through a lot in the game. You can just appreciate that for what it is. Nerves settled, Daley-Mclean led England out alongside her sister and niece and proceeded to mastermind a 57-5 victory, finishing the contest with 17 points as the USA struggled to cope with the early dismissal of Megan Rom. Amid the immense pride that the Loughborough Lightning playmaker felt to join Clark, Hunter, Tamara Taylor and Amy Garnett in their exclusive club, there was a slight sense of relief that the wait was over. “With the sport we play, you’re never guaranteed a cap for England, obviously, because you’re playing for your country and then there’s the whole factor of injury and everything else that goes with it,” she said. So, now Daley-Mclean has become a centurion is Clark’s tally of 137 England caps a target? “Not at all!” she said. “Actually the hundred was never something I set out to try to achieve. I think when you start talking about numbers, I just want to play for England and I want to play for England as long as I’m good enough and as long as the coaches see value in me for the squad. Daley-Mclean is still hungry to add to her international tally, though, and the possibility of playing a Women’s Rugby World Cup in New Zealand in 2021 has provided the 32-year-old with plenty of motivation. “I went out there for the men’s World Cup in 2011 and that was phenomenal,” she said. “It will be over a longer period of time (due to schedule changes) but obviously that means the test will be tougher as well. “And I just think the opportunity to go and play in New Zealand … going over there last summer is definitely up there as one of my favourite rugby memories, in terms of obviously going over there, the result was in our favour that day. Despite helping England to a 29-21 victory against the Black Ferns in Rotorua in June 2017, Daley-Mclean knows she will have to continue to work hard to retain her place in Simon Middleton’s squad over the next three years. It seems unlikely that conversation will be had any time soon, especially given full-time professional contracts are due to be awarded to the England women’s squad from 1 January. Daley-Mclean has never seen rugby as a means to make money, but she is proud of the work that has been done during her time with the squad that has enabled this situation to unfold. “When you’re in it you don’t really appreciate it,” she said. “But I’m sure once we all eventually retire and look back on it, it’s going to be something pretty special to think we put the game in a place that allowed full-time contracts to be possible. As she looks ahead to the future, Daley-Mclean is hopeful that more unions will follow suit. “Contracts are going to be massive but I also think you’ll hopefully see that happening across the board,” she said.